If you've been dying to start poking around the Android Wear source code, now is the time! Google just posted 4.4W to AOSP. The active development branches are distributed throughout each project repository as kitkat-wear. This is the location where further patches and minor updates will appear. 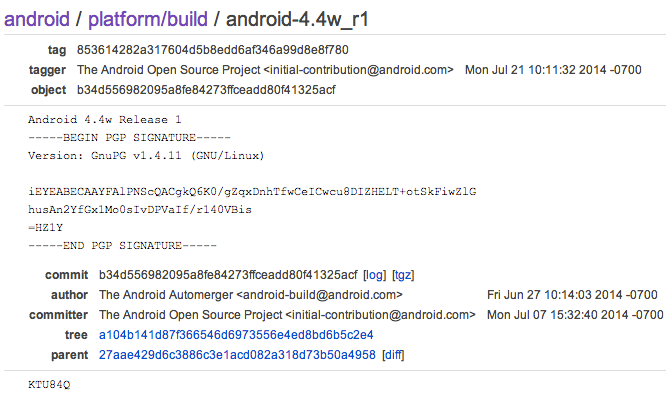 There is are also tags for android-4.4w_r1 (build KTU84Q), which represent the first official release of the platform. While early adopters of an Android Wear wristwatch should probably anticipate quite a few updates to fix bugs, add features, and fine tune the experience, it's also exciting to think of what developers in the community can produce when left to their own devices. This is also great news for app developers that have been looking forward to diagnosing unexpected behavior brought on by bugs in the platform. Update: It seems Google did another partial upload, much like the one for the Android L release. Again, this seems to be mostly updates to GPL-licensed projects. Here is the explanation posted by Bill Yi. At least developers now have access to kernel sources for Dory and Sprat. Today, we pushed a small number of GPL projects for the kitkat-wear release. The tag is android-4.4w_r1. The changes are minor since kitkat-mr2.2. We plan to do a full platform push for Android's next milestone release.